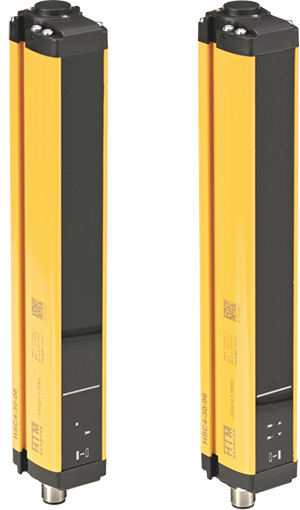 HTM Sensors, Niagara Falls, NY, has introduced Category 4 and Category 2 safety light curtains, featuring rugged C-channel aluminum housings with rotating brackets. The curtains are available with protective heights from 6 to 70 in., and provide rapid response times as well as operating distances to 19 m. They are available with mirrors and IP-69 enclosures as well as digital displays for diagnostics and ease of alignment. In addition, the company offers its new product guide, available for download from its website. The guide provides an overview of HTM Sensors’ most popular products including standard and long-range sensors, weld-field-immune sensors and proximity sensors, as well as capacitive sensors, photoelectric sensors, safety light curtains, cables and connectors, and more.